A few years ago Dutch band De Staat surprised the lowlands with a stunning record Wait For Evolution. The groove based songs were greeted with high acclaim and they played every club and festival in the country. This also spawned interest from outside The Netherlands and they even played the festivals Glastonbury and Sziget. Now their new record Machinery has been released on a different label and should push them even further up into the world. The first record was basically Torre Florim's one man project for which he formed a band to do the live shows. The new record is a true band result. The first record was said to be leaning highly on the stoner rock sound of Queens of the Stone Age and although it still has a strong connection to it they have managed to craft it into their own unique industrial sound. This means big fat grooves and the staccato almost narrative singing of frontman Florim. And the band is flying into it right from the beginning with 'Ah I See' that has a brilliant car horn riff. It continues the same big sound on first single 'Sweatshop', highly addictive guitar riffs and strong rhythmic grooves combine into a huge sound. It's hard not to move on these songs and they should sound great on stage. 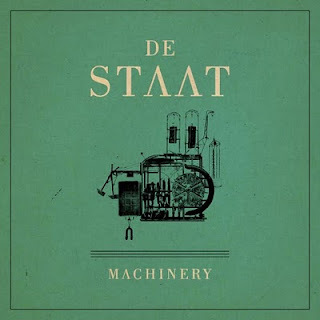 Poor farmer MacDonald from the classic song loses his farm and gets a De Staat make-over into 'Old Macdonald Don't Have No Farm No More' which is more of a dance/rock song with heavy bass accents. Halfway the album kind of loses momentum with less strong songs and things quiet down a bit. But at the end they pick it up and end with a slow heavy and sludgy tune 'Back to the Grind'. What makes this album even stronger is the use of all kinds of percussion and weird sounds that give the songs an additional dimension. You keep listening to the album over and over again to discover new elements. And the album is nicely packaged in a 64 page digibook. All the machines of De Staat are well oiled and powerful enough to take on the rest of the world.